Disney On Ice @ Allen Events Center Opening Night Discount Tickets! Disney On Ice is coming to the Allen Events Center this November (27th, 29th, 30th & Dec. 1st) and you can get tickets now before they go on sale to the general public with a very special pre-sale code I want to share with you. Plus, you can take advantage of a great discount offer for opening night! 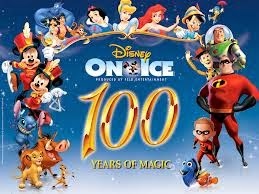 Disney On Ice: 100 Years of Magic celebrates 65 of Disney’s unforgettable characters from 18 beloved stories. You will be captivated as Mickey, Minnie, Jiminy Cricket, Pinocchio and the beautiful Disney princesses come to life. You will be thrilled by exciting moments from The Lion King, Mulan, The Incredibles, Toy Story and Finding Nemo. You won’t want to miss this skating spectacular filled with magical Disney moments your will remember forever! Order these specially priced tickets HERE and use code Z6578 to unlock the pre-sale offer! Parking at the Allen Events Center is FREE! Previous postPottery Barn Kids FREE Lego MiniBuild (Firehouse) Oct. 6th! Next postCaptain D’s FREE Meal on Your Birthday!